Between the treated and untreated strips there are still no visible differences, but the crop is progressing! The field is coming out of flowering with only a few side branches not completely podded. It’s been a few weeks since my last update, sorry for the delay! 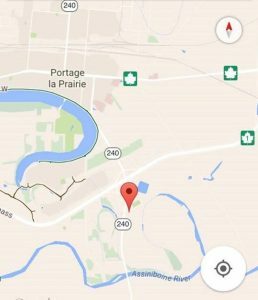 I visited the Portage UCC trial on Monday July 27th. There was still standing water in the field because the site had received 4 inches of rain in the past few days. Flowering is wrapping up and the pods are starting to fill nicely at the site in Medstead. The main racemes have the pods filling while the side branches have a few buds and flowers remaining. Conditions are much more favourable in Medstead with recent precipitation! Currently the crop is in 40-50% bloom. When pictures were taken from the air and also from the ground no visual differences were observed. 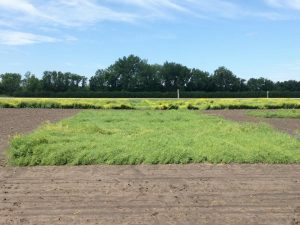 All of the boron treatments have been applied to the Portage la Prairie UCC site. Currently the trial is close to full flower. Although, over the July 4-5th weekend a storm brought 39 mm of rain and 52km/h winds, resulting in a wet site and slight lodging. So far there are no variable differences between the areas treated with boron and areas without. Pictures were taken overhead with the drone and the field was walked. 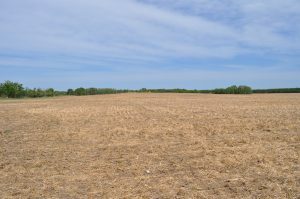 Neither view offered significant differences between the treated and untreated crop. 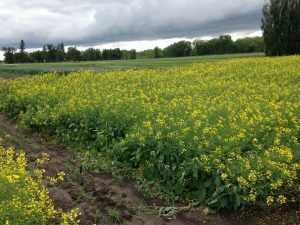 The Ultimate Canola Challenge (UCC) is a project that is designed to help canola growers identify the best management practices for their crops by testing various techniques and products. 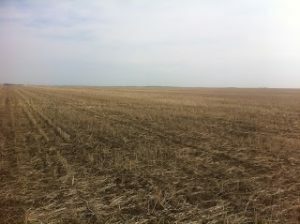 The UCC site that will be featured for Saskatchewan is located near Meadstead. 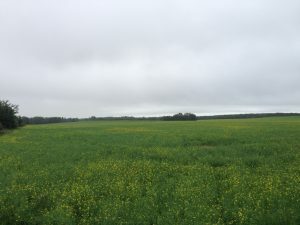 The site was seeded with the Dekalb 74-44 variety on May 14th, 2015 at a rate of 5.3lbs/acre. The fertilizer was 130-40-0-30 of actual nutrient as liquid sidebanded with 0.3lbs/acre of boron in liquid form.